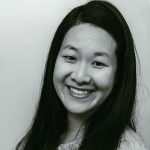 Published Jul 5, 2017 By Julia 2 CommentsThis post may contain affiliate links. 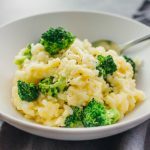 This is a simple broccoli cheddar risotto recipe: a comforting vegetarian dinner that’s easily cooked using just one pan. 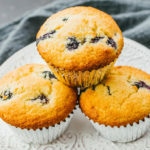 From time to time, I end up craving something with milder flavors for dinner. 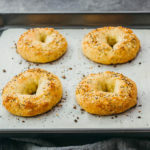 It needs to be something that isn’t exploding with bold flavors, all competing together for my attention, and it’s usually something that I would consider to be quite comforting. 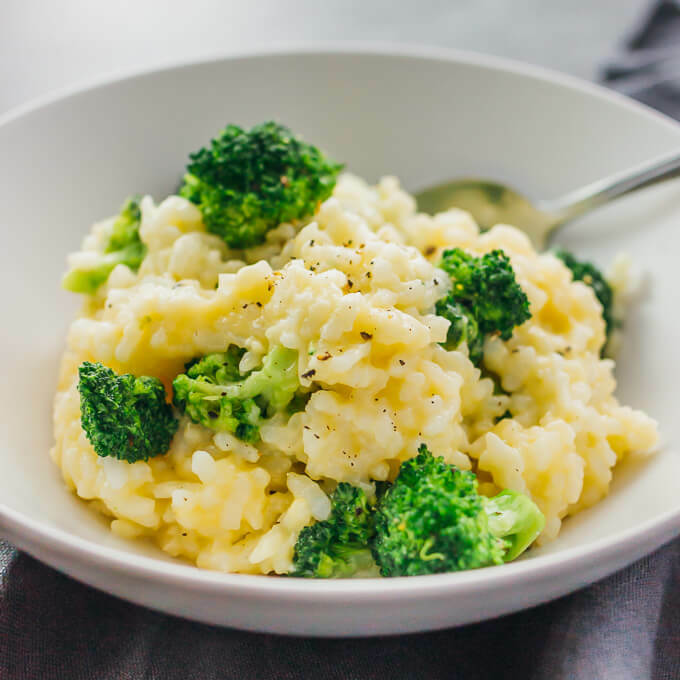 That’s where this broccoli cheddar risotto comes in. 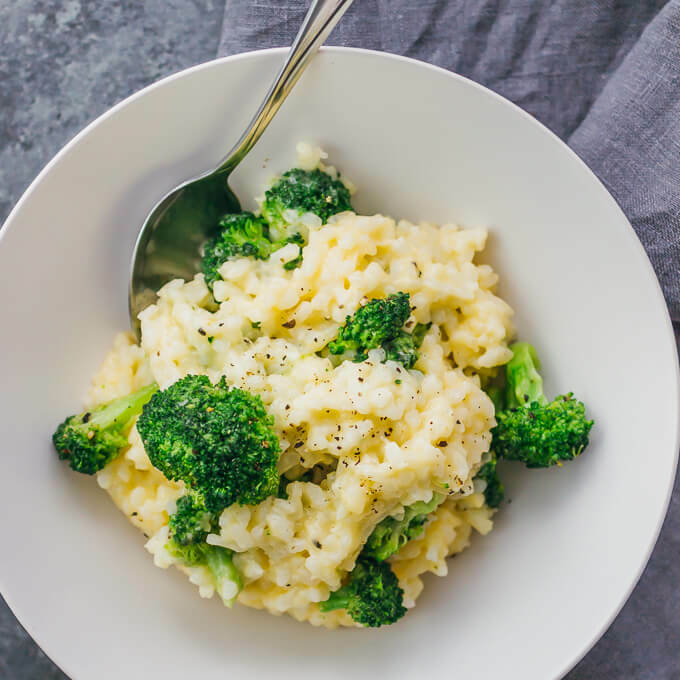 The risotto rice is thick and cheesy with cheddar flavor, and it’s accompanied by crisp bites of tender broccoli. There’s nothing complex about the taste of this dish, as it’s one of those meals where I don’t feel the urge to add additional herbs or spices, and it’s perfectly simple the way it is. 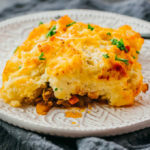 As is happening more and more often, I got the inspiration for this dish by looking at my pantry and fridge leftovers. I had a lot of pre-cut broccoli florets left over from making chicken and broccoli earlier in the week, and I also had a bag of shredded cheddar cheese that I hadn’t even opened yet. Everything else I needed was already stocked in my fridge and pantry: vegetable broth, garlic cloves, and risotto rice. 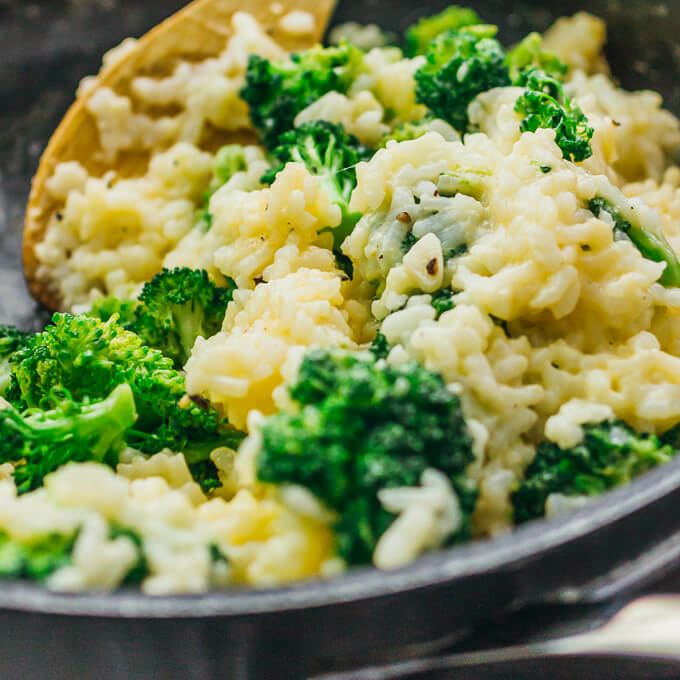 That basically sums up everything you need to make this broccoli cheddar risotto. Simple and easy. I have a couple of things that I do differently with my risottos. First, I don’t endlessly stir and add more stock. I only add vegetable stock once, then cover with a lid and simmer for 30 minutes. I use a pan instead of a pot, so that the rice has more surface area exposed to heat, and can therefore cook quickly and more evenly. Also, I don’t use alcohol in my risottos, as it’s an unnecessary complication. You can check out my butternut squash risotto and pesto risotto with portobello mushrooms for other risotto flavor combinations and tips. If you have an Instant Pot, you can make my pressure-cooked mushroom risotto with bacon and corn. If you have leftovers from this risotto and you’re looking to transform them into something different, allow me to recommend crispy fried leftover risotto rice balls or arancini. These fried balls of goodness are amazing and can breathe new life into your leftover risotto rice. Similarly, you can make pan-seared risotto cakes, or use the leftover rice to make Italian wedding risotto soup. 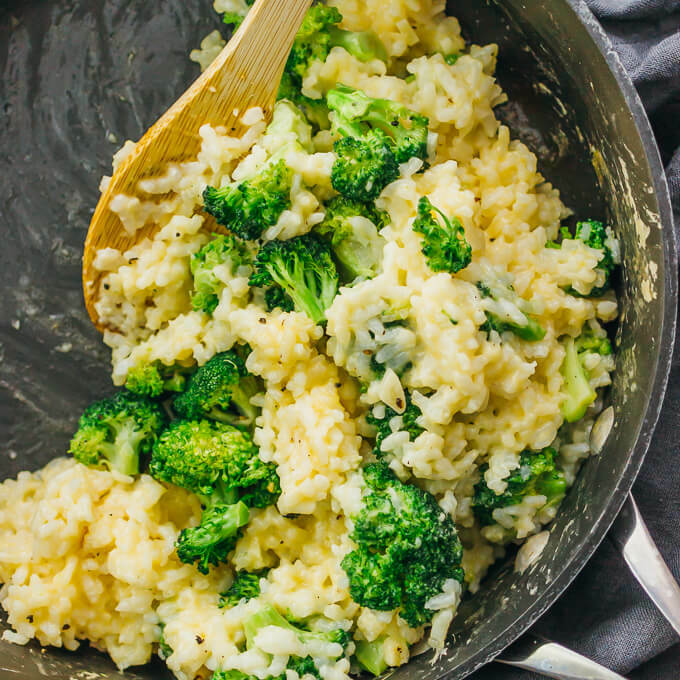 This is a simple broccoli cheddar risotto that's easily cooked in a single pan. Heat olive oil in a 3 quart nonstick sauté pan over medium heat. Add broccoli, garlic, 1/4 teaspoon salt, and pepper. Cook until the broccoli is tender, about 5 minutes, stirring occasionally. Transfer broccoli to a plate and set aside. Add rice, vegetable stock, and 1/2 teaspoon salt. Stir. Bring to a boil over high heat, then cover with a lid and decrease to medium-low heat or lower to maintain simmer. Simmer for 30 minutes. Uncover the pan and check that the rice is tender and done. Add cheddar cheese and stir with the rice until melted. Add broccoli and butter to the pan, stirring until the broccoli is heated and the butter is melted. Serve while hot.